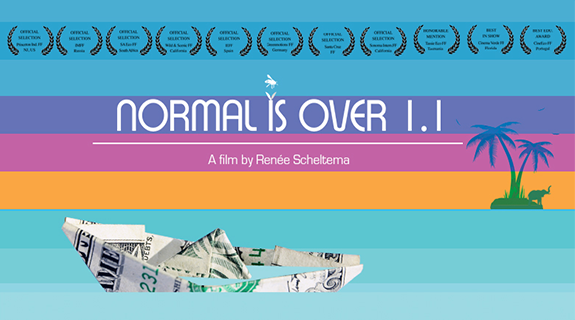 NORMAL IS OVER THE MOVIE, THE NEW UPDATED VERSION IS NOW AVAILABLE FROM THE WEBSITE . (English version only- ..for now..) New translations to follow soon. This award-winning documentary is connecting the dots: A look at the financial and economical paradigm underlying our planetary problems, while offering various SOLUTIONS to reverse the path of global decline. We created ecocide under the relentless pressure of an outdated profit based economic system. We need to become aware that we are nature, and that we have to stop converting “free” natural resources into money. Our 200 year old economic system needs a make-over! #NormalisOver is about humanity’s wisest responses to climate change, species extinction, resource depletion, income inequality, and the connection between these issues. The 8 translations, created by awesome volunteers from all over the world, still need to be adjusted. We plan to create an educational version; a series; a new film and more. Once Normal is Over flies, we will update you about my research into a sequel documentary. SCREEN Normal is Over, or RENT the film, HERE. Discover what’s new, spread the word and take ACTION!